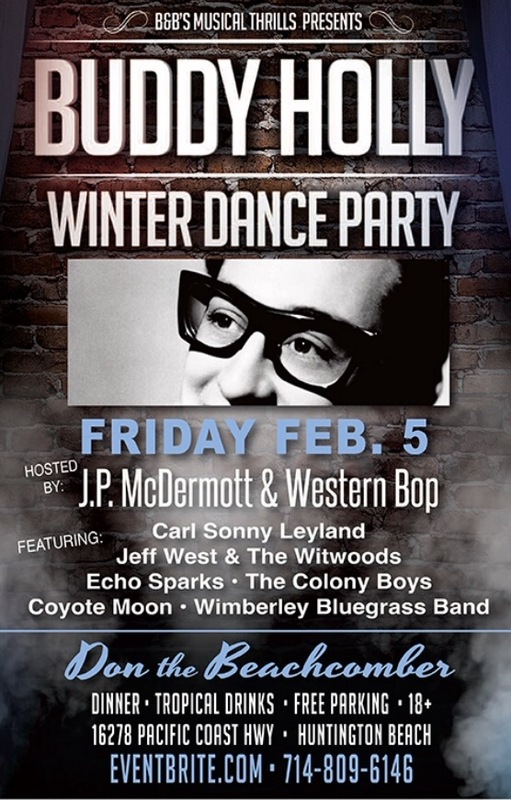 Feb. 5th Buddy Holly Winter Dance Party with J.P. Mc Dermott – Rockabilly L.A.
A recent transplant to Orange County, J.P. McDermott led one of the most popular rockabilly bands on the East Coast and was the recipient of many Washington (DC) Area Music Awards over the years. McDermott has an abiding love for Buddy’s music, and has hosted Holly events for many years, including a lecture at the Smithsonian on Buddy’s life and musical legacy. He says that one of the high points of his life was playing a show at the Buddy Holly Center in Lubbock, TX on what would have been Holly’s 75th birthday. Meeting members of Buddy’s family and the real-live Peggy Sue made the day especially memorable. McDermott’s versatile and hard-rocking combo, Western Bop (Fabi Losa, DA Valdez, and teenage guitar sensation Anthony Castagna), will serve as the house band, backing a plethora of special guests representing some of the finest musicians from the diverse and compelling music Southern California roots music scene. Incidentally, the name of the band comes from Buddy’s original business card that touted that he played both kinds of music — Western and Bop. The Winter Dance Party is one of the highlights of the season, gets bigger and better every year, and is one whole heck of a lot of fun. This is a once-a-year chance to hear some of the greatest rock and roll music written performed by a wide range of great talent, and dance at a classic venue that dates back to Buddy’s time.